TAIPEI, Taiwan, January 25th, 2019 – The leading global motherboard manufacturer, ASRock, is proud to introduce the new ASRock Steel Legend motherboard series. ASRock Steel Legend motherboards are built around the most demanding specs and features to provide a wide array of materials, components, and features that ensure stable and reliable performance. 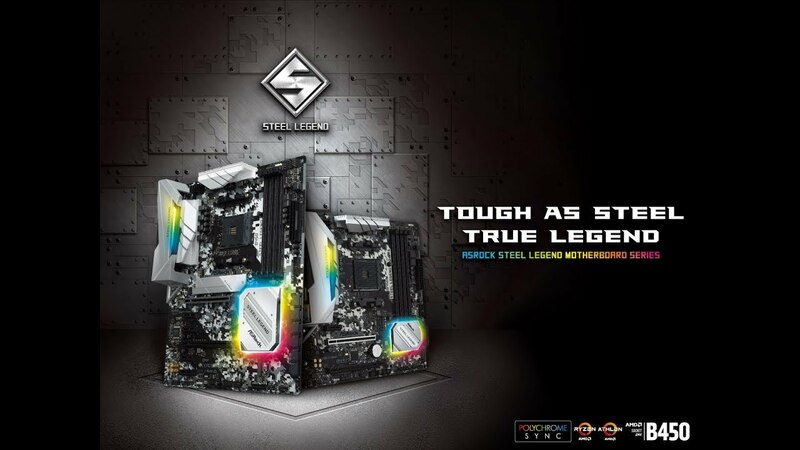 Steel Legend motherboards stand out from the crowd through its massive and luscious XXL Aluminum Alloy Heatsinks, I/O Armor, PCI-E Steel Slot, Polychrome Sync (Addressable RGB LED) support, and detailed PCB print on Sapphire Black PCB for mainstream users, gamers, and professionals that choose to work and play in style. With support for the latest AMD Ryzen processors, as well as high-quality audio featuring the highest quality Nichicon golden audio caps and signal shielding integrated into the PCB. ASRock has gone to great lengths to ensure optimum stability and protection. With ASRock Full Spike Protection on all USB, Audio and LAN ports, users are always protected from Lightning/ESD damage, which is a comforting thought when using Steel Legend motherboards in challenging environments. Use of Premium 60A Power Chokes and Nichicon 12K Black Caps means not only that the B450 Steel Legend and B450M Steel Legend will remain rock solid no matter the task, but it also keeps your system stable when overclocking, for extra performance, whether you're gaming or rendering professional content. Integrated AMD StoreMI support means that the B450 Steel Legend motherboards can deliver top-level storage performance, while support for AMD Crossfire™ allows gamers to look forward to getting maximum graphics performance from their system, which PCI-E Steel Slot ensures your graphics cards stays firmly in its slot, without suffering from any external interference. With the performance, stability, and protection demands covered, the B450 and B450M Steel Legend are ready to support you whether you're a professional gamer or lover of high-quality 4K content. The B450 Steel Legend is a full-featured ATX motherboard for first and second generation AMD Ryzen™ processors with Radeon™ VEGA graphics for socket AM4. The B450 Steel Legend comes with a full-featured I/O panel which includes HDMI & DisplayPort ports for 4K video when using AMD Ryzen™ and Athlon™ processors with integrated Radeon™ RX Vega and Vega graphics. ASRock's unique M.2 Armor protects and enhances the performance of M.2 SSDs. For connecting to a variety of (gaming) peripherals, the B450 Steel Legend features two USB 3.1 Gen2 (Type A, Type C), four USB 3.1 Gen1 Type A ports, and a Combo PS/2 port with USB 2.0 ports for gamers still rocking their legacy peripherals. This Micro ATX version packs the same punch as its big brother, in a size optimized for space-constrained builds. Because of the focus on size, the B45M Steel Legend features dual M.2 sockets that offer flexibility for DIY users. It also provides the same stable power thanks to the premium 60A power chokes and Nichicon black 12K capacitors and also supports up to DDR4 3533+ overclocked memory. No matter the size, you can't go wrong with the ASRock Steel Legend motherboards.